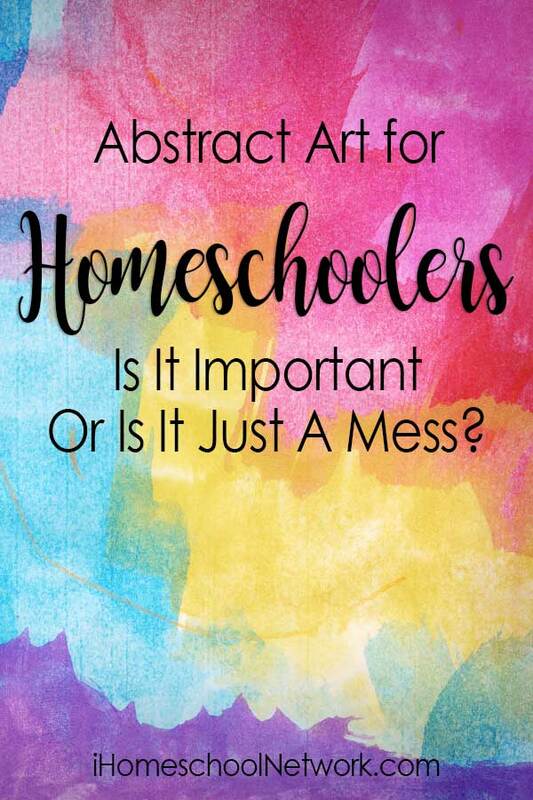 Abstract Art for Homeschoolers – Is It Important Or Is It Just A Mess? I know many people who just don’t “get” abstract art. So many parents gloss over it as they teach their children, and they really shouldn’t. Abstract Expressionism is an ideal style to teach your children. For early childhood, it’s perfect on a sensory level as they make marks with paint and they watch how the bristles of the brush squish around their canvas. 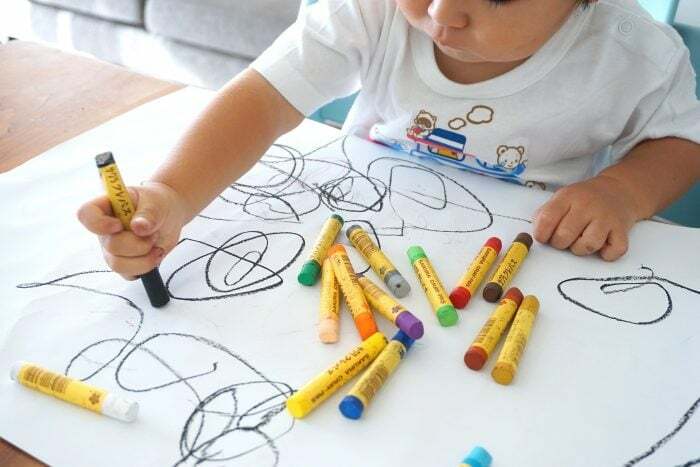 As children grow and become conscious of objects around them they want to identify things, but children can’t necessarily draw what they see and often get frustrated and lose their interest in art. Abstract art removes identification and labels so we can process on an emotional level. It connects us. Abstract Art. Should you teach it? Is it Important? Or, is it just a mess? If you or your children struggle with trying to be perfect I highly encourage you to learn and try abstract art. Psst… yes you can learn right along with your kiddos. Best part of home education! Right?! Every day we deal with human imperfection and abstract art embraces that by enjoying the process of creating without worrying about the final outcome. Enjoying the process of coloring, painting, stamping, gluing, or whichever medium you decide you enjoy. I really enjoy adding layers and layers of liquid pouring medium so that my paintings look almost like glass with bits in between the glass. My good friend April who is a professional abstract artist loves painting with wax (encaustic) adding layers and layers then melting them together with a blow torch! Admittedly, abstract art doesn’t come naturally to everyone (but some it does!) My oldest son really struggles. He like to draw pictures from books (using a reference). He’s a real life practical kid and that’s great, however I do still encourage him to create abstract art because I understand the personal growth and self-confidence that comes from abstract art through critical thinking and reasoning, invention of their ideas, self direction and creative problem solving. As parents, it’s difficult to watch your child struggle and make mistakes, we often step in and try to fix problems for them. Abstract art is a safe environment for them to explore their ideas because it’s about the process not the final result. So How Do You Get More Abstract Art in Your Home? It can be something as simple as painting with something you wouldn’t typically paint with (this will help remove any perfectionism) such as a flower or matchbox cars – my boys LOVE driving paint around making tracks, or what about drawing lines all over the page (scribbling of sorts) then coloring in those shapes you’ve made? Those are quick ideas, but if you’d like to dive deeper into abstract art April and I have created a course for homeschooling families. Each lesson we introduce an artist of the abstract expressionism movement sharing their notable artwork and what made them stand out in the art world. There are hands on projects that are easy for the parent to put together that teach the basics of art for each lesson. Each lesson then leads to the end product of a grand masterpiece. To help support parents we offer guided questions with each project to assist your young artist in evaluating and understanding the artwork. We also have a student journal with guided questions where kids can write their thoughts about their grand masterpiece which they will work on throughout the course. April and I are both homeschooling moms who encourage you to roll up your sleeves and create together with your kids. We designed the course to be flexible and fit your family. You could do a lesson a week or a month. Whatever works for your family. For my family we like to dive in deep on most topics. We are that family that are STILL doing Story of the World Vol. 1 because there is so much to learn and we are loving it! If you’d like to check out the course you can find it here. Abstract Expressionism is a great art movement to learn with your kids because its about the process not the outcome. Kids often get frustrated when they can’t draw what they see. Abstract art removes those barriers to allow them to explore their inner thoughts and it gives us permission to celebrate human imperfections. If you allow it you will be surprised by your child’s expressions. Amanda is an artist turned homeschool mom. She found her love of music over 20 years ago, and after attending a fine arts college to receive a BFA she made a living as a artist. She is a course creator offering unique music and art courses for kids, a blogger at Raising da Vinci, and happy homeschooling mom. You can find her on most social media but her favorites are Instagram, Youtube, and Facebook.